IMI Technical Services staff of architects, engineers, and construction professionals stand willing and able to entertain your technical questions. Q: We have been getting many requests for cavity inserts lately. Do they really help with water management? A: Currently, there are no accepted industry standards for determining “how wet is too wet.” But let’s use plain old common sense. To create a good bond between concrete masonry units and mortar, units have to have enough suction to draw in the mortar’s moisture. Too much suction leaves too little water in the joint to develop strength; too little suction means not enough strength. Too much moisture may create shrinkage cracks; too little means dry outs. Then there’s weather, one of the most critical, variable, and uncontrollable factors in a construction project. Complicated? Yes! This is where skilled craftworkers come in. Mortar can be adjusted to accommodate some moisture variations in units or humidity, as can the spread length of the bed joint. Good Rule of Thumb: If you can’t see a difference in shading by splashing a little water on a unit, then it is too wet to be laid. It sounds subjective, but a good craftworker knows this limit. Q: Can I use anti-freeze to keep mortar going in cold weather? A: “Heat, don’t treat,” is a good rule of thumb when dealing with mortar in cold weather. Accelerators can be used, but must be non-corrosive and non-chloride. Schiffer Mason Contractors, for example, came up with an innovative way to protect people and materials at the Iona prison project. There, they set up 60-foot wood roof trusses to create a steeped roof, holding reinforced plastic over 32-foot sections heavy on interior walls. Masons and other trades hummed along all winter, sometimes in their shirtsleeves, slicing months off the schedule. “It was cost efficient, no question about it,” says Vice President Mike Maher. Q: Can fly ash be used in masonry grout? A: Yes. In 1999, fly ash was added to the material list within ASTM C476-99 Standard Specification for Grout for Masonry. This means it is an approved material in grout. What is not obvious in this standard is the maximum amount of fly ash that is permissible. That is 40%, when used with Portland cement. The mix cannot exceed 40%, if approved by the specifier. While this isn’t clear from an initial reading of the ASTM C476 standard, it is the correct interpretation. Q: We’re designing a college dormitory and are concerned with fire safety for the residents. We’ve heard of the concept of “balanced” design, but would like to understand it better. In a balanced design, these four strategies are used together as a system, not traded off one for another. Active systems such as sprinklers and alarms work well, but only as long as the supporting mechanical systems work. They can’t provide the structural integrity needed for safe evacuation and fire fighting. They are clearly an integral part of the early warning and suppression equation, but passive systems like compartmentation with masonry walls work 24 hours a day, regardless of the mechanical systems. Masonry walls contain the fire and noxious gases and remain structurally stable—enhancing the evacuation of residents and the safety of fire fighters. Blending active and passive systems, rather than trading them off each other, is the balanced approach to fire safety. Prevention—to reduce the chance of having a fire through housekeeping, education, and building layout. Detection & Alarm—Smoke detectors and other warning devices to catch a fire when it is small, and hopefully keep it from growing into a larger one. Suppression—Using sprinklers, fire extinguishers or other suppression systems to assist in putting out the fire quickly and effectively. Strategic Compartmentation—Using building construction features like masonry fire walls to isolate and contain the spread of fire and toxic smoke while maintaining the structural integrity of the building. This is necessary to allow for the safe evacuation of the residents and to provide the fire fighters with sound and safe areas from which to fight the fire. Q: Can brick veneers extend below grade? A: Good question. 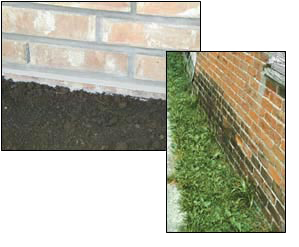 Brick and other masonry materials are porous and ideally should remain above grade. If your brick veneer comes in contact with the earth, your wall may experience unsightly stains caused by “rising damp” — the wicking of moisture and impurities. However, we realize some designers do not want to “see” bare foundation walls around their new buildings. In this case, you should install through-wall flashing with a drip edge to stop rising damp. Remember, your flashing material will now need to be supported so it does not sag and create an internal gutter. We recommend grouting the space under the flashing for the dual purpose of flashing support and added stability for the sub-grade wall. A: The idea of drainage wall or “cavity” inserts is not new. Contractors have been asked to install pea gravel into the base of a cavity wall (or single wythe wall) to help water reach weeps. However, depending on your geography and methods, that has limitations. Recently, the market is flush with good “new” open cell inserts including — but not limited to — base inserts of synthetic woven plastic (which keep mortar dropping at different levels), full height cavity inserts, galvanized metal screens spanning the air space above the weeps, and full height drainage boards. Weeps and wall vents serve two purposes. First, they let water drain from the wall. Secondly, they let air into the wall cavity to promote rapid drying of the wall. So, Yes, good cavity inserts allow weeps and vents to do their jobs. But, having a cavity insert device is no substitute for good workmanship. A craftworker cannot be any less careful when managing mortar droppings. Contact a local IMI training program for proven mortar dropping control strategies, at 1-800-JOBS-0988. Q: What can we realistically expect to see in the field when we specify “clean” cavities in our masonry cavity walls? A: “Clean but not pristine,” says it best when it comes to debris in the cavity. The key word in your question is “realistically.” It tells me you recognize that masonry is a material laid by hand in field conditions, during all kinds of weather and site situations. Keeping every single mortar dropping or protrusion out of the cavity is not cost effective and it is not necessary. The drainage cavity should be a nominal 2“ clear to allow for proper construction of the wall and to minimize mortar fins, droppings, and bridging. The purpose of the cavity is to drain any water before it can penetrate to the interior. Some mortar droppings and protrusions are to be expected, but the key point is the performance of the cavity: is it draining the water to the flashing? If it is draining, then the cavity is clean enough. You can work out guidelines for this with the job site sample panel prior to the project start so that everyone is clear about expectations. Q: I am confused. Sometimes, architectural specifications call for not wetting masonry when it is being cut. What is proper? A: The proper approach, in terms of both material and worker safety, is to cut wet. Some firms’ specifications take an overly cautious approach, due to a fear of material shrinkage. 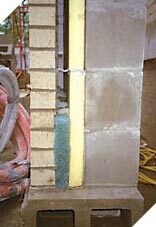 Shrinkage occurs as concrete masonry units dry, hence cautions about not laying wet block. IMI’s Construction Guide on architectural specifications says: cut wet. The amount of water added to the unit during site cutting is insignificant in terms of shrinkage, but a very real measure to protect the health of the workers cutting it. Wet cutting reduces the risk of air-born silica particulates, which have been linked to silicosis — a debilitating lung disease. Q: We’ve had some problems with flashing the top of a single-wythe masonry wall when we use split-faced block units. We use a metal cap, but should we use flashing under it? A: Architectural concrete masonry units have an irregular surface. That gives them their architectural interest, but also makes it difficult for the top cap to conform to the surface and to seal out wind-driven rain. Using flashing material under a metal cap (usually a self-adhering flexible product) is good practice. It helps prevent moisture that may penetrate the metal cap from entering the core spaces in the block. 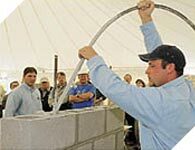 Another good practice is to use a standard concrete masonry unit for the top course, instead of the architectural unit. That gives the vertical legs of the metal top cap a regular, vertical surface to conform to, and it is much easier to caulk under the cap’s drip edge, forming a seal between cap and masonry. Even a half-high unit can be used, most of which gets covered by the top cap, avoiding visual distraction. And don’t forget two other important steps: detail a drip edge on the cap to direct the water away from the wall surface, and include proper laps on both the cap and the flashing. Q: What is the purpose of tooling a mortar joint? A: Tooling has several purposes. Aesthetically, it produces the joint profile, which is made when the jointer or “tool” is struck against the mortar before the joint has set. This profile is usually concave, but it can have other configurations, such as a grapevine or “v” shape. Functionally, proper tooling increases the water penetration resistance of the wall. The tool compresses the mortar against the unit, helping seal any slight separation cracks that might form at that interface. The action of jointer on the unset mortar brings the fines to the surface. This creates an exterior skin more resistant to water infiltration. Timing is key. Too early and the joint won’t seal, too late and it can pull the mortar away. Tooling is done when the joint is “thumbprint” hard. For color consistency, joints should be tooled at the same moisture level. The sequence of striking must be consistent — head, then bed joints or vice versa. A good BAC craftworker is trained in proper tooling techniques. Q: We plan to hang stone panels for the exterior face of our building. The back up system will be concrete masonry. What things should we consider when selecting an anchoring system? All metals in direct contact with the stone must be non-corrosive and non-staining. Stainless steel is usually recommended. Take care to avoid any potential for galvanic action between non-compatible materials. This can be accomplished with an isolation material. The anchoring system needs some adjustability built in to accommodate construction tolerances, since the backup wall is usually installed way ahead of the panel. The system has to transfer the loads from the stone panels to the backup wall, yet allow for differential movement between the two materials. Think about the installation sequence when detailing the anchorage of panels. So often what looks good on paper back at the office does not translate easily under field conditions. Factor in issues such as working space between the backup and panel, panel weights, construction tolerances, etc. Finally, any other job-specific requirements or conditions must be factored into anchor selection and detailing. Q: What exactly is prestressed masonry, and what do I need to know about it? A: Prestressed masonry is a very viable new masonry system that everyone from designers to craftworkers could stand to learn more about. It is masonry construction using either concrete or clay units, which has compression added. This method of reinforcing masonry can afford an economical alternative. For more information on design and installation, see IMI’s new Masonry Construction Guide on Prestressed Masonry. It covers frequently asked questions, construction sequence, and plenty of illustrations. That means it has a lot to offer everybody: architects, structural engineers, contractors and craftworkers. For copies of this or other IMI Construction Guides, call 1-800-IMI-0988. Q: Help! I am caught between an architect and an engineer over whether to use lime putty to tuckpoint a 168-year-old building. The engineer insists that, regardless of the brick age or strength, Portland-lime cement, versus lime putty, is the way to go. A: Portland-lime mortars are stronger, but in this case, that is not a desirable characteristic. If the mortar is harder than the unit, the unit will crack or deteriorate as the building tries to move. The general rule is: never replace a mortar with one of higher compressive strength. The best approach is to get a mortar analysis to determine the original mortar’s composition and compressive strength, and then find a pointing mortar to match. Other factors when matching pointing mortars are color, texture, profile and tooling. 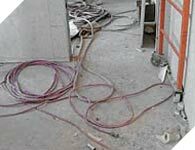 An experienced, union mason contractor specializing in restoration can help with this matching process. Generally speaking, with old buildings, the brick units are much softer and lower in compressive strength. Mortars used then were sand-lime based and softer. That’s why sand-lime or lime putty mortars are generally preferred for historic structures. Q: This is what the floor looks like that we are installing ceramic tile on. Should I use acid to clean it? A: Contrary to popular belief, acid is not the correct cleaner to use when preparing a dirty floor for the installation of ceramic tile. 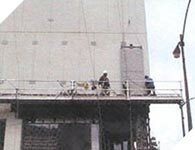 Dilute acid cleaners have long been used in the masonry industry to clean Portland cement haze from brick and tile surfaces after grouting. Acid cleaners do not remove organic compounds such as oil or grease, and tend to leave an acid residue behind. If not removed properly, that can affect the bond of Portland cement- based adhesives. Use a degreasing detergent to clean the floor. Use of a wetvac for final cleanup will help to insure that no residue is left that can affect the bond of the adhesive. Q: What are the minimum temperatures in which one can lay brick masonry? A: With proper protection, masonry can be installed in virtually any weather condition, but there are a couple of key things to remember. First, codes, specifications and standards provide for protection of the masonry and the masons. The Masonry Standards Joint Committee Code and Specification (MSJC), Section 1.8C on cold weather lists the goals as assuring proper mortar curing and proper bonding of mortar and masonry units. 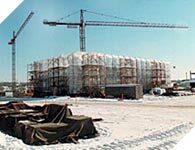 Even if a cold weather construction plan is not required in the spec’s submittals section, the code requirements are mandatory. Second, mortar temperature must be kept between 40o and 120o F, and the units above 20o F. Units with ice or snow must not be laid. A third requirement is covering unfinished work at the end of the day (and not just in cold weather). A note on additives: Use of additives that could affect curing time requires prior approval. Some additives can be highly corrosive. Q: What is mortar testing, and should we do it? A: Mortar testing is one of the most misunderstood things in masonry construction. Although the tests may seem relatively straightforward, the interpretation of results is often used incorrectly. There are two ASTM standards that relate to this issue, ASTM C 270 (Specification for Mortar for Unit Masonry) and ASTM C 780 (Test Method for Pre-construction and Construction Evaluation of Mortars for Plain and Reinforced Unit Masonry). These two standards should NOT be used in combination. C 270 relates to the mortar specification before construction begins, and values are based on lab conditions. C780 relates to mortars prepared and sampled in the field, and only gives methods of testing, not compliance values. Bottom line: It is best not to do any mortar testing. Widely varying test results and difficulty interpreting them often just add confusion. The better way to ensure proper mortar is to observe the mixing. If forced to have some tests, ASTM C 780 can be used as a quality control measure. Take a baseline value at the beginning of the project, and then compare subsequent tests to that (not to values found in ASTM C 270). Prism testing of an entire assembly could be done the same way. 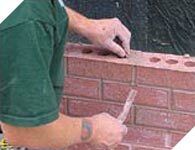 This information can be used to make judgments about the quality of the masonry. Q: What kinds of educational programs does IMI have to offer designers and contractors? A: We’re glad you asked. Here is a list of IMI educational programs coming in 2004. We can also tailor programs to a firm’s specific needs. Just call 1-800-IMI-0988.